Well, here at Osram it’s pretty much Christmas all year round with all the lights. But especially in the run-up to Christmas we feel a bit like avid beer drinkers during a brewery tour. Although the days are gray and only last just about as long as a movie, as soon as darkness falls everything around us is bathed in light. It’s Christmas time. People decorate their trees in the garden, their homes and the city center. They hang up long chains of lights in all the colors of the rainbow, making the dark hours that little bit brighter. At one end of the scale you have those who totally ignore Christmas and boycott all lights and at the other end you have American-style illuminators who light up their homes in the brightest of colors with what seems like millions of lights clearly visible from space. In the middle are the ordinary people, the ones who delight in strings of lights and candles. But that may not always be to the taste of all the other residents; often trees in the front yard are lovingly clad in tacky light blue neon garlands. Flashing sleighs with a life-sized Rudolf and a façade-climbing Santa Claus – which hasn’t been funny since the 90s – are not always right up the neighbors’ street, but hey, that’s taste. One thing everyone agrees on now is LEDs. While in the 70s a family home with festive lights still consumed the same amount of power as an entire shopping center, today it’s only a few watts for twice as many lamps producing three times the brightness. And the heat that is now released isn’t so high that migratory birds would turn round and the tulips would start to bloom on Christmas Eve. LED lighting is something that reached city centers a while ago. 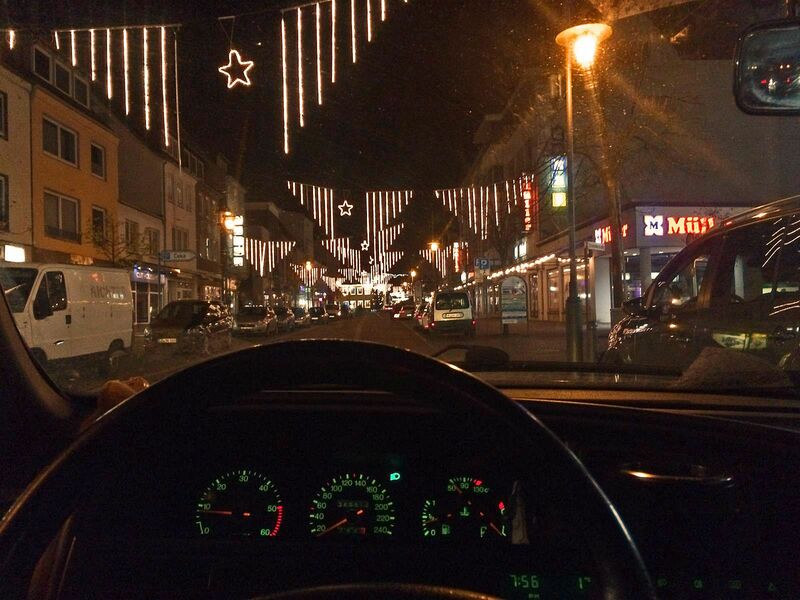 While driving slowly through my hometown of Uelzen in the northern part of Lower Saxony the way I always do in December, I discover more and more blue-and-gold LED shooting stars which have replaced the classic decorations with their “old” bulbs. 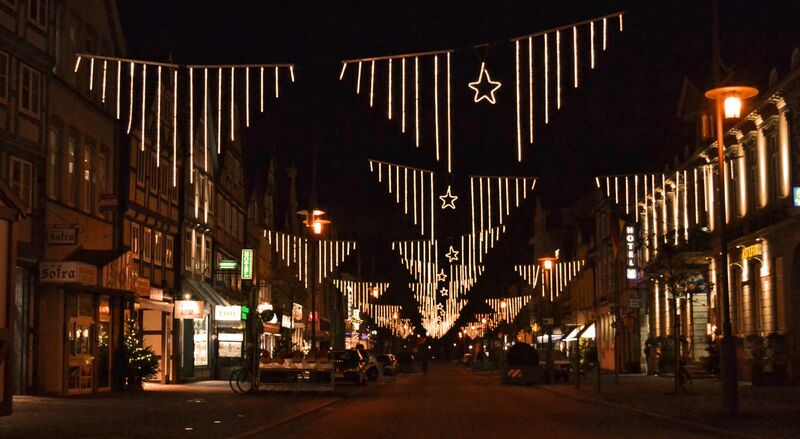 I grew up with the old lights, which always spanned the traffic-calmed main roads like a starlight canopy pre-Christmas, and bathed the Christmas market in a warm light. Warm’s the right word here; by replacing the old incandescent bulbs with LED technology, almost 90% of electricity costs can be saved this year. We’re talking thousands of kilowatt hours here. That hurts us children from the past. But it makes sense. And somehow it still looks beautiful. By the way, the pictures still show the old lights. You’ll have to find out for yourself what it looks like today. While going at a crawl, feasting on aromas of mulled wine and bratwurst through the crack in my window, I think about LEDs in the car. A lot is still to come; we’re still only at the very beginning. The lights of the slowly approaching cars are really bright when flashed at me. It’s really impressive to see what lighting options there are now for vehicles. And someone’s flashing again. And again. And the next one as well. Looks great. In a brief “light bulb” moment it dawned on me that they wanted to tell me something. Among all these festive lights I hadn’t noticed that I’d been driving with my parking lights on since leaving the parking bay. Oops. Well then, a very merry and bright Christmas.